Avion n° 3 is an aircraft designed by Clément Ader in 1897. Ader's progress with aircrafts attracted the interest of the minister of war, Charles de Freycinet. With the backing of the French War Office, Ader developed and constructed the Avion III. 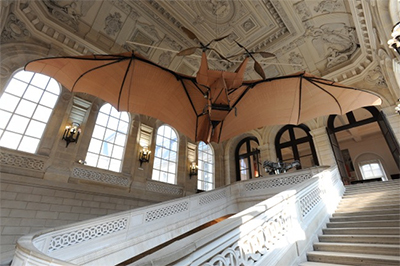 It resembled an enormous bat made of linen and wood, with a 15 m (48 ft) wingspan, equipped with two four bladed tractor propellers, each powered by a steam engine of 30 hp (22 kW). Using a circular track at Satory, Ader carried out taxiing trials on 12 October 1897 and two days later attempted a flight. After a short run the machine was caught by a gust of wind, slewed off the track, and came to a stop. After this the French army withdrew its funding, but kept the results secret. The commission released in November 1910 the official reports on Ader's attempted flights, stating that they were unsuccessful 1). A copy of Avion III can be found in Musée des arts et métiers in Paris. Avion III is also drawn on the cover of the second album of Revoir Paris.